Dixon, 'Abd al-Ameer 'Abd, The Umayyad caliphate 65-86, p. 122: “Another threat to ‘Abd al-Malik’s position in Syria at this time came from the Byzantine Emperor, who, encouraged by the political confusion of the time, stirred up the Jarājima (Mardaites) against the ‘Arabs. According to Balāduri, a Byzantine cavalry came into the Amanūs district (Lukām) and penetrated as far as Lebanon. This force was joined by a large number of Jarājima, Anbāṭ (Nabateans) and runaway slaves. The caliph found himself compelled to make a treaty with them, guaranteeing them a weekly payment of one thousand Dīnārs. Then, following the precedent of Mu’āwiya, he offered peace terms to the emperor. “The contents of the treaty between them are preserved only by the Christian sources. According to this treaty, the caliph agreed to pay 365,000 gold pieces, 365 slaves and 365 thoroughbred horses; he had also to surrender half of the tribute from Cyprus, Armenia and Iberia. In return, the emperor Justinian II agreed to withdraw the Mardaites, and he recalled 12,000 of them to be settled in Byzantine territory. It is interesting to note here that the Christian sources reproach the emperor for denuding the frontiers in this way. The Jewel of Muscat - a successful arrival into Kochi, its first port of call. A site you should absolutely check out is this. 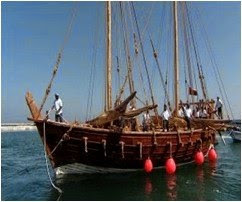 The government of Oman funded a project to build a replica of a 9th-century Omani seagoing vessel, using traditional materials and methods, and sailed her to Singapore following routes and using seafaring and navigation methods that would have been used at the time. 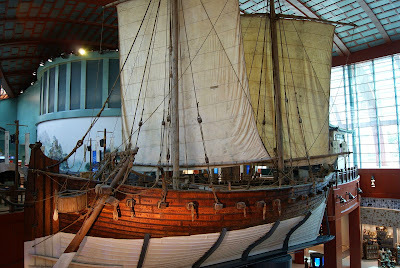 Although it's a couple centuries removed from your period of research (and mine) and is likely a different style of vessel than what would have been used for military purposes, the site is rich with detail about shipbuilding and seafaring methods for the period. Best of all, it includes a wealth of fascinating videos. Vastly interesting. A vast trove of information on Islamic ships and shipbuilding is here. Another great possible source is an article called "Aspects of Arab Seafaring: An Attempt to Fill in the Gaps of Maritime History," Ed. Y. Y. al-Hijji and Vassilios Christides, Athens, 2002.